Summer 2015 is a time of innovation in C-U. 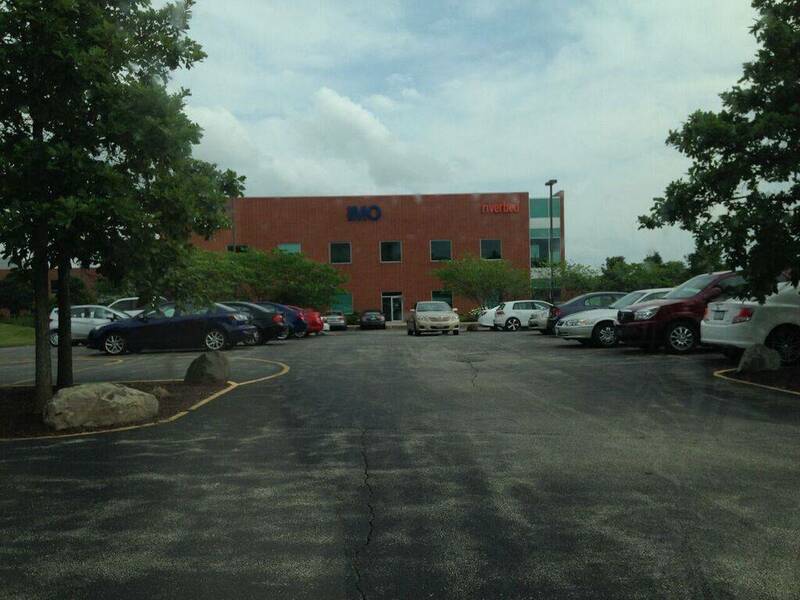 Over at Research Park, the iVenture Accelerator (previously the Entrepreneurship at Illinois Fellowship) is in the middle of building a better future. A fairly anonymous building at Research Park. But like the TARDIS, it's bigger on the inside. The iVenture Accelerator is a brand-new entrepreneurial initiative of the University of Illinois Urbana-Champaign that brings together thirteen teams to create new tech and solve social problems. You read that last part correctly. If the words “entrepreneurship” and “startups” fill your imagination with visions of sugar plum fairies and whiz kids typing away in sterile white palaces, this article is for you. These kids are whiz-zy, to be sure, but one of the most newsworthy aspects of the iVenture Accelerator is how invested the startups are in fixing problems. For instance, iVenture Accelerator team MakerGirl, which Smile Politely featured a few weeks ago, uses 3D printing to inspire young girls to get into STEM fields. To participate in the Accelerator, each team applied in the spring. They demonstrated that their product or idea could create commercial, cultural, or social value in some respect. There were 36 applicants, and 13 teams were admitted, representing over 25 majors and minors across campus. During the summer, the students work full time at Research Park, and over the next year, they will continue to work on networking, learning from mentors, and improving their products. There are no equity stakes, just educational outcomes. Successful outcomes are measured in milestones. Ryan Singh, Business ’14, Lead Coordinator for the iVenture Accelerator, notes that milestones are different for every team. “For some teams, it’s getting 500 app users. For others, it’s getting 200 more girls in a STEM program,” he says. I sat down with Singh to talk about the kinds of projects supported by the Accelerator. Smile Politely: What is the iVenture Accelerator? Ryan Singh: The iVenture Accelerator is made possible by the University of Illinois, which is really keen to support students as they address social challenges and create products of value. It’s a learning-through-venturing program that draws on the entrepreneurial heritage at the University. 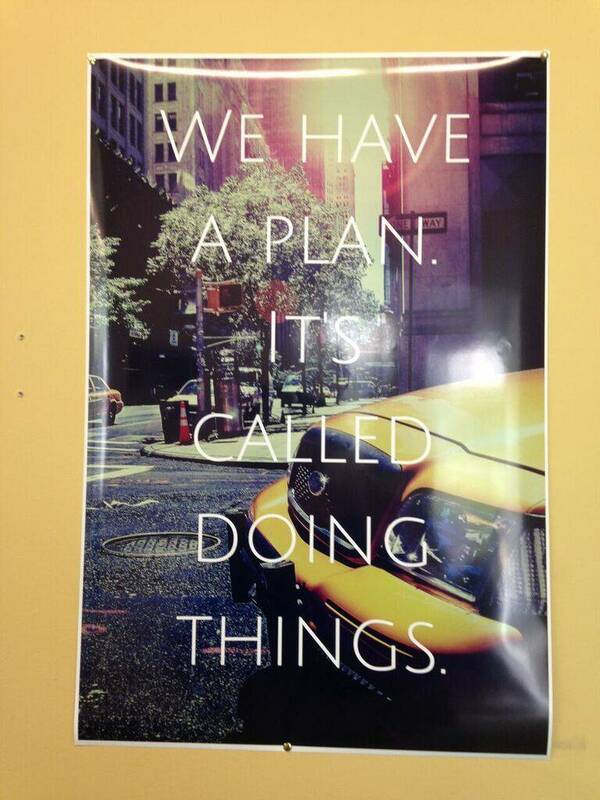 Inspirational poster at iVenture co-working space. There’s another aspect to it, though, which is that this program identifies and fills a gap. Two gaps actually. The first is money. During the summer, a lot of students do internships. Most students are poor and don’t have the time to work on their startup ideas. The opportunity cost, essentially, is very high. The Accelerator provides these students with time and space to create. The second gap is a social challenge. Entrepreneurship can be very limiting in who it attracts. A lot of people think only white and Asian men who work on mobile apps are entrepreneurs or can be part of a startup. We want to come together across campus and get rid of silos that break up fields of study and people. We wanted to create a space that leads to collaborative work among all students at this university. There’s a much higher presence of women where than anywhere else, more underrepresented minorities. We deliberately advertised this program to every college, not just Business and Engineering. And people responded to it: Fine and Applied Arts (FAA), Liberal Arts and Sciences (LAS), Agricultural, Consumer, and Environmental Sciences (ACES), they were surprised to see these opportunities and they responded. SP: How does the iVenture Accelerator support student innovation? RS: We provide financial support of $2,500 stipend per student, with up to $10,000 in seed funding per startup. We provide the space. We provide diversity of thought and experience. We take them out to Chicago for Chicago TechWeek, which helps them meet interesting people and get tapped into alumni networks. We bring in faculty-led workshops, guest speakers, and coaches like someone from KickStarter recently came in to give a presentation. Students have access to legal teams to help them understand how to responsibly market their products. 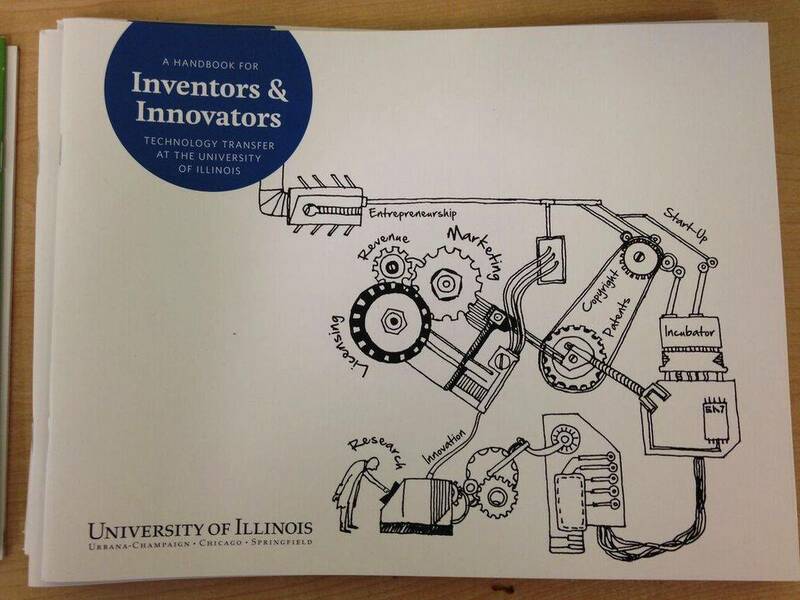 A Handbook for Inventors and Innovators. Reading material at iVenture co-working space. And we provide them with a vocabulary of how to understand their work. FAA can be entrepreneurial; artists are definitely entrepreneurs. They create and sell their work. They just don’t tend to talk about it in the same way. They don’t say things like “minimum viable product” (which just means prototype). We give them the vocabulary they need. So for instance, after a heavy tech workshop, I’ll check in with the teams and ensure that what was said at the workshop resonates with every team, that we’re all getting something from it. Probably the most important thing, though, is the community. 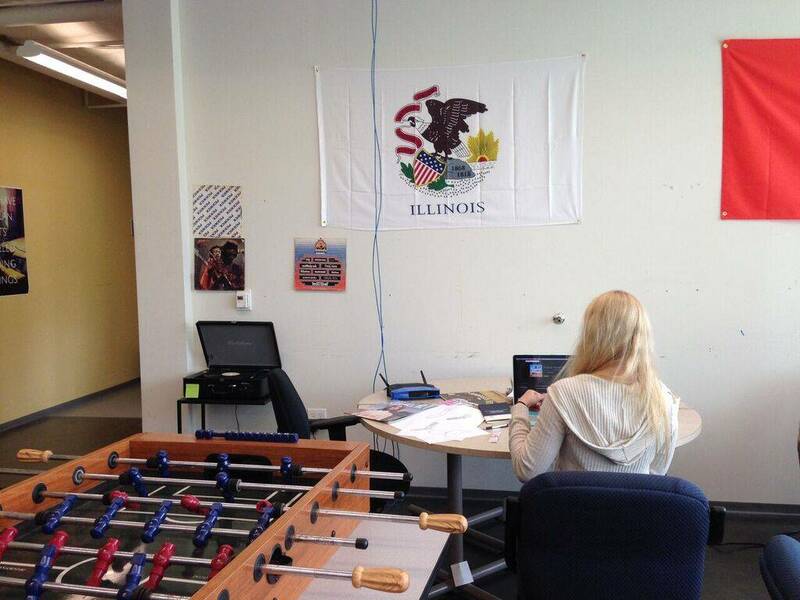 In our co-working space, the students get to work with each other. There’s really good buzz and energy in here. 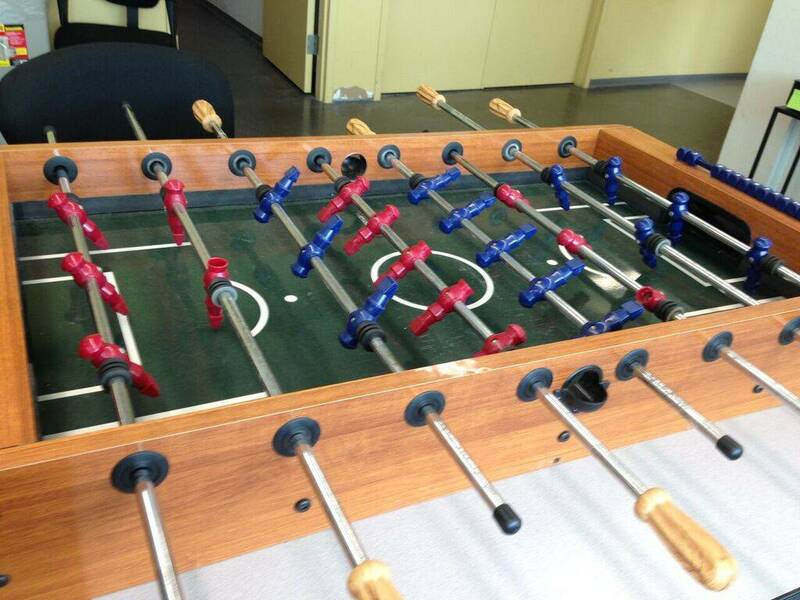 Game table at iVenture co-working space. 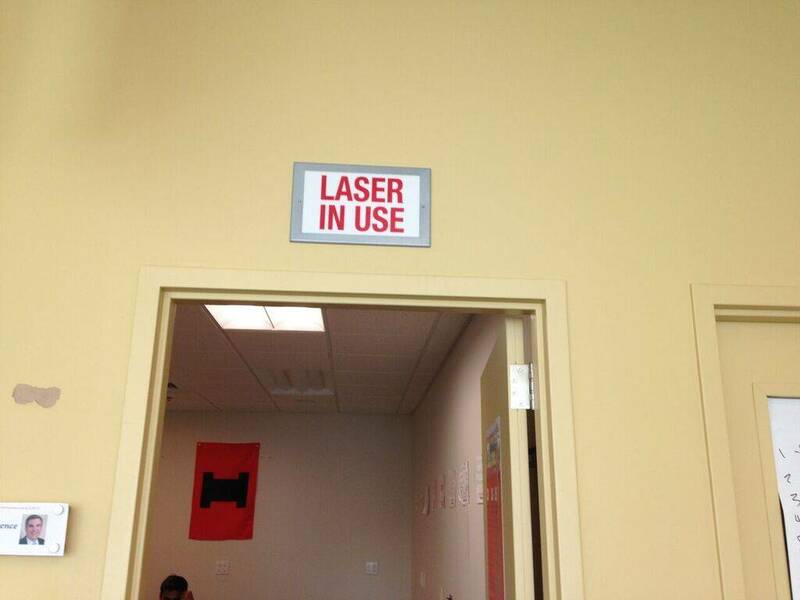 Laser sign at iVenture co-working space. Work space at iVenture co-working space. SP: What drew you to this kind of entrepreneurship? RS: If you told me when I was a freshman that I’d be doing this work, I would have laughed. I majored in Marketing and Finance. I did some internships, some of which I liked and some I didn’t. But I wanted a higher purpose, a cool chance to apply what I’ve learned and help people. Then I took Professor Noah Isserman’s class, which provided a cool intersection between business and management and addressing social purposes. In the class, every student designs a venture. Mine was an after-school program called Dream Studio. Dream Studio ran in Urbana, Centennial, and Central high school. It was awesome to see shy little kids become slam poets, in the program that’s designed to provide them spaces for artistic self-expression. Now I’m working with Noah to create ways for students and faculty to apply their knowledge to address social challenges. Part of this is broadening the definition of entrepreneurship and that’s why I’m helping lead the iVenture Accelerator this summer. 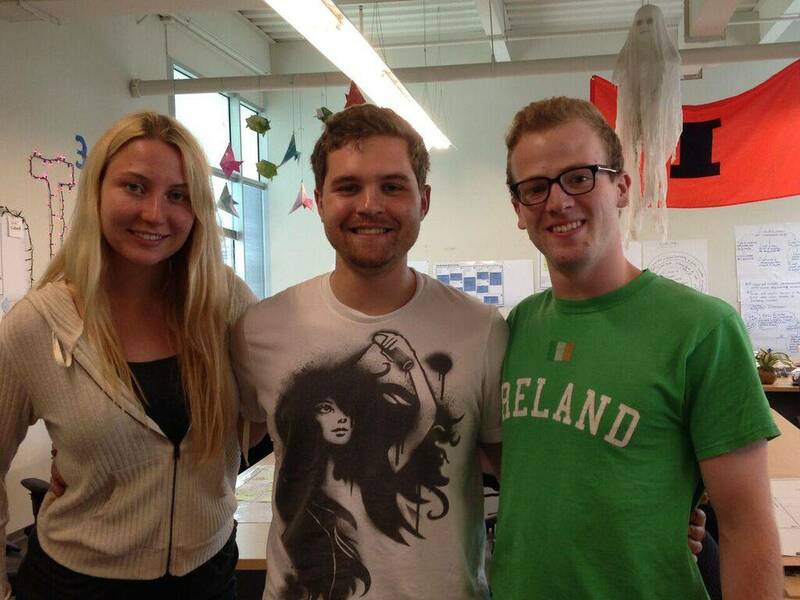 Ryan Brown, Julie Polaski, and Andrew Simpson, all seniors in Industrial Design, have a good lead-in to their product. Left to right: Julie Polaski, Andrew Simpson, Ryan Brown. “The number one cause of death among firefighters is heart attack,” begins Brown. They’ve designed the Corvae heart monitor to track dangerous heart activity before it leads to death. The wireless heart monitor is a patch worn by users. The patch gathers data and reports it to an app, which keeps careful watch on potentially dangerous rhythms. 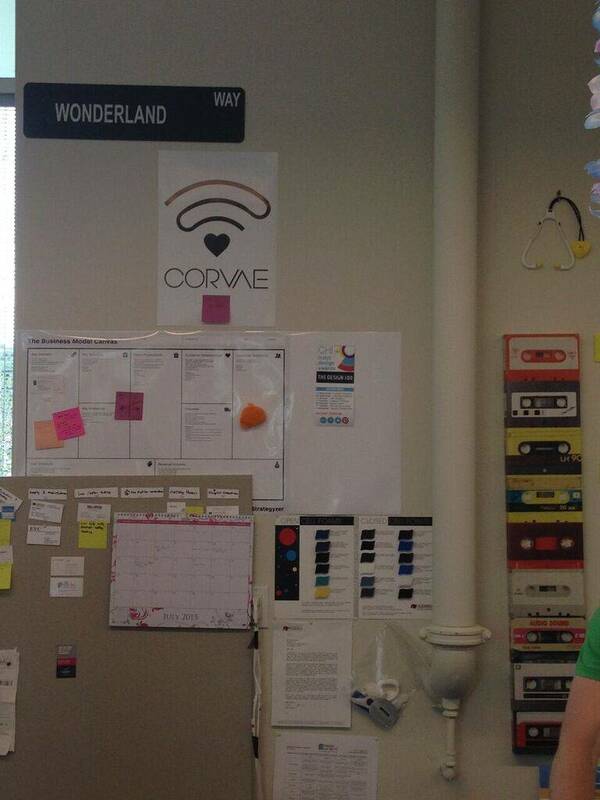 Corvae wall at iVenture co-working space. It’s a simple and potent idea. But it wasn’t always this streamlined. The team points out that Raj Vinjamuri and Sid Muthal, two Engineering students on the team, started the idea. But early versions had the monitor embedded in a large hospital gown. “Think a big, blinking Snuggie,” Brown says with a laugh. When Engineers and Industrial Design majors came together, an easy-to-wear patch emerged that people will be much more likely to use. 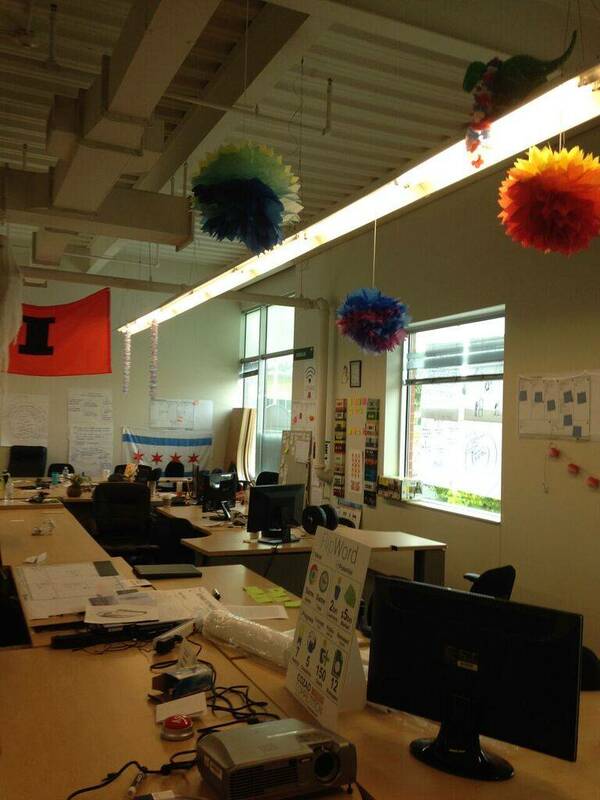 It’s that focus on the intersection of technology and good design that iVenture Accelerator nurtures. It does so by focusing on people. “It creates opportunities to do a lean startup, where you get users in the loop right away, fail, refine, fail, and refine. Fast iteration,” Simpson says. Ryan and Polaski confirm that they’ve gotten immediate feedback from users, which allowed them to improve their product now instead of waiting for months of development only to have the product fail later. The iVenture Accelerator makes these connections possible. The team credits being associated with the Accelerator as responsible in part for getting their product into the hands of their potential customer base. But the Accelerator also stresses connection and collaboration between teams. I noticed this when the Corvae team, excited to talk about their product, also expressed concern that other teams weren’t getting the same opportunity. This is no doubt due in part to the space itself, wherein all teams gather to work together on their various projects. But it's also due to the mutual admiration the teams feel for one another. “Just being immersed in the startup world, with all of these people, is a great experience. It’s its own ecosystem, everyone keeps everyone motivated,” Polaski says. “I hope it continues and more students get this opportunity,” Simpson adds. 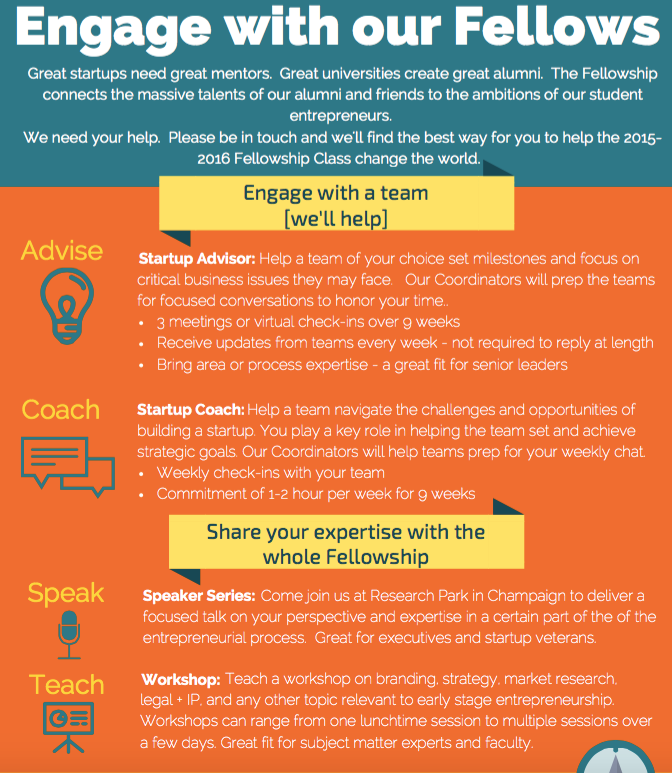 What’s coming up for the iVenture Accelerator? Singh isn’t quite sure but he’s excited. Everyone involved wants to see the program continue. But should they bring in a new cohort of student entrepreneurs? Should they continue working with this first generation? If they get the funding they need, regardless of the structure, iVenture Accelerator will be back, building new things and relationships a team at a time. 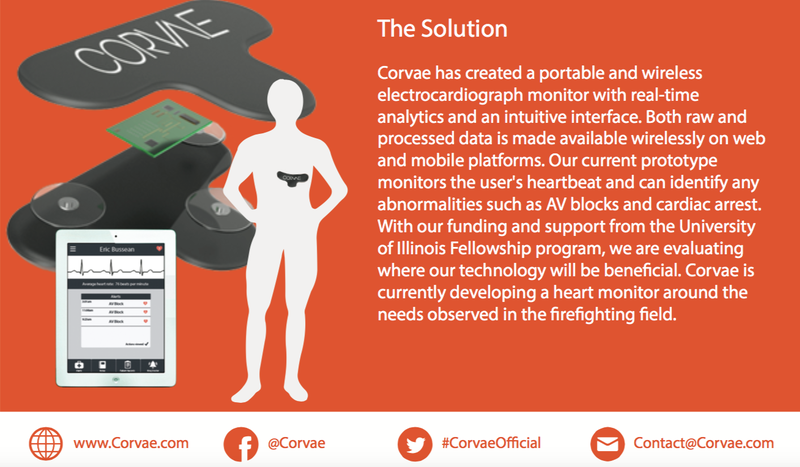 For more information about the Corvae heart monitor, please contact members of the Corvae team. They can be reached at julie@corvae.com, andrew@corvae.com, and ryan@corvae.com. All photos taken by Ashley Hetrick.